Alan Cruddace (Assistant Manager), Ronnie Phillipson, Tony Smith, Gordon Smith, Mick Morgan, Eddie Alder, Ronnie Scott, Tommy Dixon. Alan O’Neill (Manager). Pat Smith (trainer/physio), Mickey Lister, Gerry Donoghue, Brian Slane, Mick Dagless, Micky Pink. 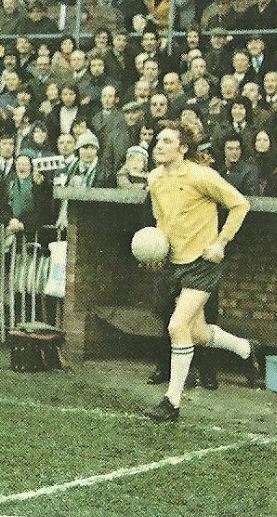 The extremely rare photograph shows the Spartans in their Umbro away kit of all yellow with green trim, it’s actually the 2nd of 3 team photo’s that exist from that truly remarkable 1974/1975 season. This team photograph only ever appeared in the Rothmans Football News magazine. 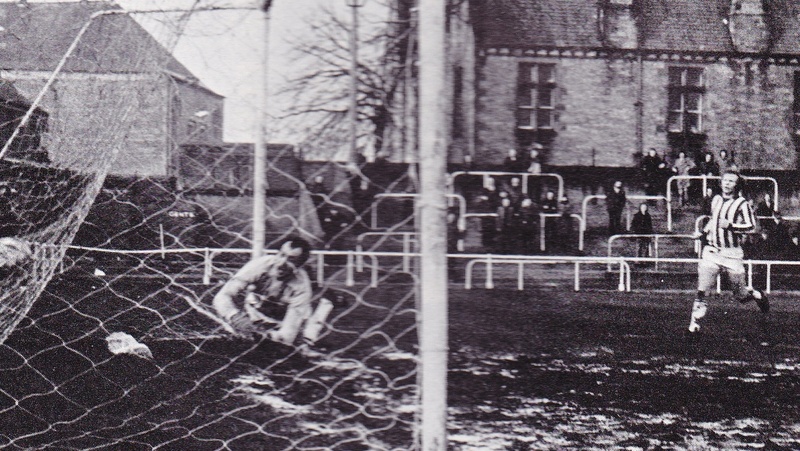 It was taken at Willington’s Hall Lane ground before the kick off on Easter Saturday, it was taken by County Durham based Galdon Photographers who supplied many images to the magazine. Back Row (LtoR): Dave Burowski, Alan Cruddace, John Lang, Ronnie Phillipson, Micky Pink, Mick Third, Ronnie Scott, Alan O’Neill. Front Row (Lto R): Mickey Pink, Gordon Smith, Eddie Alder, Brian Slane, Mick Dagless, Ian Nixon. Inset Gerry Donoghue. This well know team photo from earlier in the season featured in the Preston North End FA Cup replay programme, another extremely rare colour photo has recently resurfaced courtesy of the old 70’s Non League magazine, Rothmans Football News. The magazine was produced in conjunction with Rothmans, the new Northern League sponsors. Rothmans were pioneers in Non League football sponsorship putting their name to the Isthmian, Western, Northern, Hellenic Leagues (as well as Guernsey and Jersey), and in 1974/75 these were the first leagues to award 3 points for a win and not 2!. The excellent magazines were edited by the oracle of Non League football Tony Williams, the magazine ran from 1974 until 1977. 1974/75 season 5 bi monthly issues were produced. 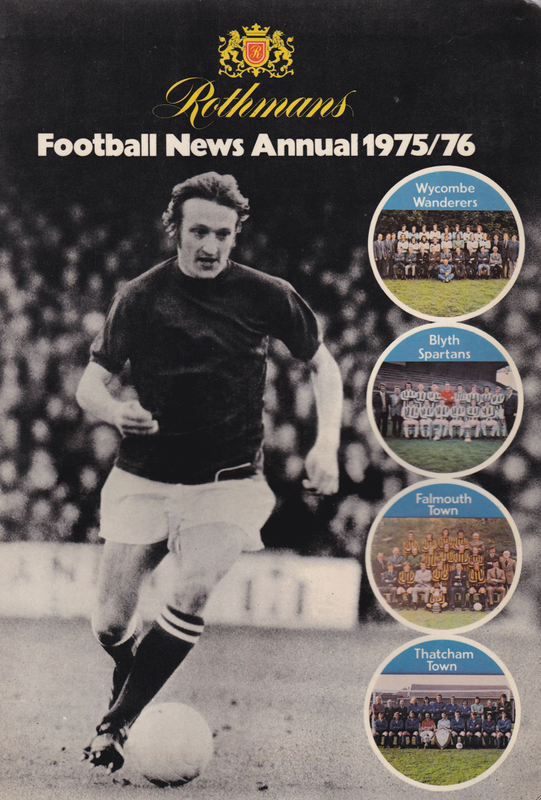 1975/76 season 7 monthly issues plus an end of season annual were produced. 1976/77 season only 1 mid-season annual was produced. Rothmans also ran a national Challenge Cup competition for 3 seasons (1975/76, 1976/77 & 1977/78) clubs from each division were entered into a series of straight knock out ties, in 3 years it ran a Northern League club won it every time, Whitby Town 75/76, Tow Law 76/77 & Whitby again in 77/78. Rothmans would meet any losses incurred and any profits made by clubs would go in to the “pool” to offset the losses, however the competition was besieged with problems by the 3rd season due to the sheer distances involved, several ties never got played as teams struggled to arrange suitable dates and many games were awarded as walkovers as teams just pulled out of the tie and in the last season the Isthmian league didn’t enter any clubs. 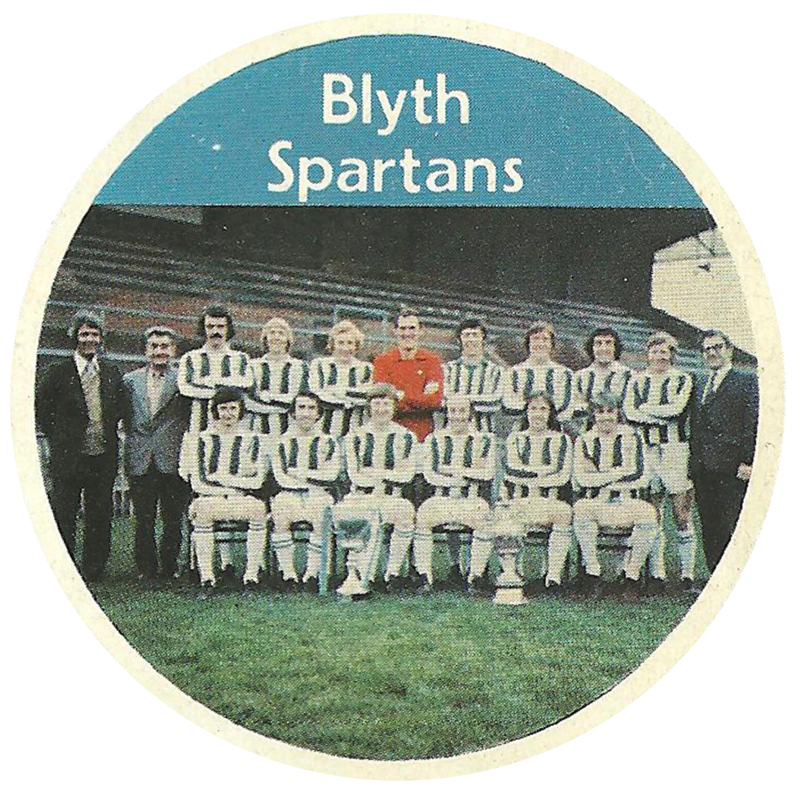 Blyth only played in the competition once in the inaugural 1975/76 season, when the Northern League entered all 20 clubs and in that one season the competition’s problems were clear to see as Blyth were drawn against teams from Oxfordshire, Somerset, Gloucestershire & Greater London!. The Spartans only involvement was certainly eventful to say the least, they played out a 5-5 draw in Gloucestershire winning the tie on penalties!, needed extra time to beat a team from Oxfordshire at Croft Park and when drawn away in Great London despite offering available dates to play the tie the London club couldn’t agree to the arrangements. Being drawn away to Ilford in the Semi Final, Blyth were eventually awarded the tie, as a ‘walkover’ when Ilford couldn’t agree to any suitable dates that Blyth were able to offer. And to sum it all up when the club reached the Final thanks to that ‘walkover’ it ended up having to be played in the following season!. 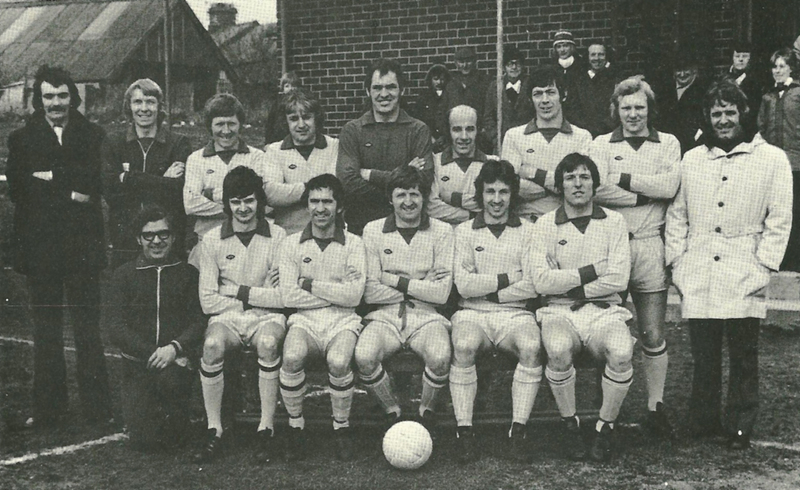 The 1974/75 Rothmans Northern League season needed to be very special to go one better than the club managed the previous campaign, having won the title in 1972/73 by scoring 102 goals to pip Bishop Auckland to the title by 2 points, the club looked on course for retaining the league until the 11 game unbeaten run ended with two surprise midweek results that derailed the title charge. A 0-1 defeat at Shildon on Wednesday 24th April 1974 handed the initiative to rivals Spennymoor United and despite a 6-1 hammering of fellow title chasers Willington at Croft Park 3 days later the 1-1 home draw with Penrith on Wednesday 1st May ended Blyth’s hopes of retaining the title, Spennymoor made up ground and both team finished level on 64 points after 38 games. The Championship was decided on a Play Off game staged at Portland Park, Ashington on Tuesday 7th May, Des Jardine got Blyth’s goal in a disappointing 1-2 defeat. It had been an excellent season for Eddie Alder & Billy Fenwick ‘running’ the team but Chairman Jim Turney and his board felt appointment of a new manager was needed, they acted quickly appointing the experienced former South Shields manager Alan O’Neill in June 1974. Leadgate born O’Neill had lost his job as South Shields manager when history repeated itself in the summer of 74’ when they became Gateshead United, he had been manager of the founder members of the Northern Premier League club since returning to England in December 1972. Alan had made full Sunderland debut in November 1956 at the age of 18 as an inside forward having played for Sunderland Boys & the Durham County side. He made 74 appearances for the Black Cats scoring 27 goals before moving onto Aston Villa, Plymouth Argyle & Bournemouth amassing 174 Football League appearances, after his playing career ended he took up coaching appointments in South Africa, Dublin and the USA before coaching the Canadian National team until his return to the North East in the December 72’. 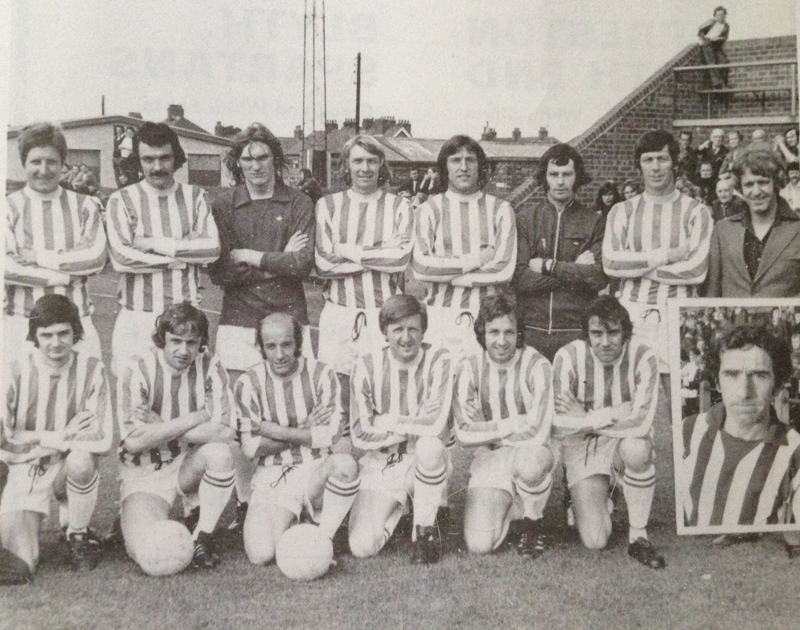 South Shields 1973/74 Northern Premier League squad. O’Neill, pictured back row far left along with Cruddace (back row 5th from left). Burowski sat next to Pat Smith far right of front row. His 2 years at Shields had been quite successful steering them to 6th in a NPL that contained Wigan Athletic and taking them to the Semi Finals of the FA Trophy in 1973/74. With him in June 1974 came his trusty trainer Pat Smith, Pat was to stay on at Croft Park for many years serving as trainer & physio. With him from The Mariners playing staff came right back Alan Cruddace & central defender/midfielder Dave Bukowski, however most of Billy Bell’s 73/74 side stayed on with only a few exceptions. Out went 3 long servants to the club in Bobby Varvill, Gordon Atkinson & Des Jardine all 3 making well over 150 appearances for the club, right back Atkinson joined 1969 while striker Jardine had been at Croft Park since 1968. Goalkeeper Bobby Varvill who had been at the club for the past 3 seasons had shared the goalkeeping duties with Peter Ewart in 1973/74. O’Neill showed his credentials as a manager with some astute signings he brought in 2 goalkeepers, one highly experienced and one promising youngster. Mick Morgan was signed from North Shields having been a FA Amateur Cup winners in 1969 and ever-present the Robins side and 18-year-old John Lang was signed from Hylton Colliery Welfare Juniors !. It was tall wiry Lang that caught the eye and got the nod as first choice over the experienced Mick Morgan, Lang impressed so much that he instantly attracted League scouts including Newcastle United manager Joe Harvey. Lang played 18 games before joining Newcastle United on a month-long trial on 15th January, his spell at St James wasn’t successful and he returned to Croft Park, however Morgan was established first choice and Lang couldn’t dislodge him and was released signed for West Auckland. It was O’Neill’s ability to bring in key players during the season that really cemented his pedigree as a manager; all 3 arrivals in particular caught the eye. 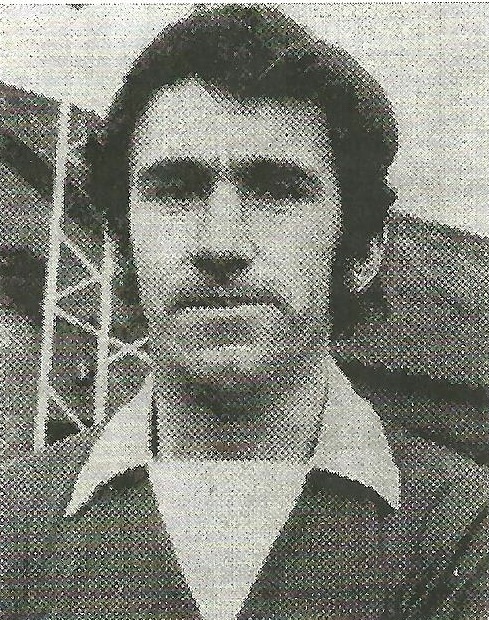 Former South Shields midfielder Gerry Donoghue had joined Scarborough in 1972 and gone on to become one of their most important players, captaining the side to a Northern Premier League Runners Up the spot in 1972/73 and winning the winning the FA Trophy at Wembley in the same season, so it was a major coup when O’Neill brought him to Croft Park. Donoghue made an instant impact scoring on his debut in a 6-1 win at West Auckland on 9th November 1974, he would go on to score 9 times playing in all 28 games following his arrival and Gerry showed his versatility as a footballer by covering as a right back & left back in several occasions. The 2 other key arrivals came as a result of losing the services of 2 players who came with him for South Shields, Allan Cruddace had been an ever-present at right back until an injury in January 1975 ended his playing career (he officially became O’Neill’s assistant in July 75′), his replacement was another player from NPL club Scarborough Tony Smith, who went on to make 22 appearances at right back. The 3rd arrival was young 24-year-old from local rivals Ashington by the name of Tommy Dixon! he was brought to Croft Park to replace Dave Bukowski who emigrated. 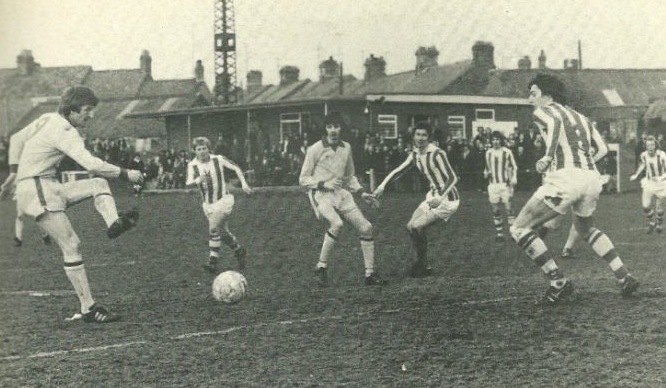 Tommy had joined the Colliers from Gateshead in 1972 and become a key player in Jackie Marks Ashington side that reached the FA Amateur Cup Semi Final. Tommy signed in January and made his debut on 18th January in a 3-2 victory over Penrith, Tom initially played as a defensive midfielder as long serving Ronnie Phillipson partnered Ronnie Scott at the centre of the defence. 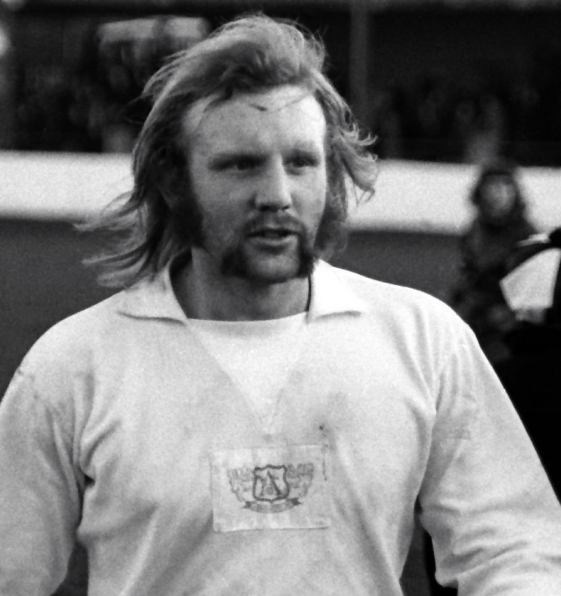 Dave Bukowski was an interesting character, born in Newcastle in 1954 to Ukranian descendants he began playing for Wallsend Boys Club and was offered an apprentice with Fourth Division strugglers Northampton in 1971, he went on to make 12 appearances before his release at end of 1972/73 season. He returned home and played for The Mariners in the NPL before following O’Neill to Croft Park. Dave made 29 appearances playing either in centre of defence or as a holding midfielder, however in February 1975 Dave immigrated to Pretoria South Africa and had a rather eventful time playing there. He signed for Pretoria Callies, 2 years later he was an established player with ‘The Romans’ when their English manager Trevor McMillan caused up roar one November weekend by signing 5 white players. This was the first time that a black-owned South African club had significantly ventured into the white market and Callies’ handed starting debuts to Dave Evans, Derick Klugkist, Harold Teague, Kim Sinovich and Rory Jones it made front page headlines in the conservative city of Pretoria. Pik Botha, the then Minister of Foreign Affairs rang McMillan personally to ask him ‘if he knew what he was doing’, but McMillan was fully aware as he ready for the new multi-racial league season that started in 1978. However, sadly there was a faction of Callies’ supporters who didn’t want white players and in 1980, one player was threatened by a knife-wielding man while showering in the change rooms. The club was relegated from the top flight that year and although they returned in 1985, again fell from grace and eventually went out of business. Bukowski then moved on to Arcadia Shepherd’s in Pretoria, where he played alongside several famous names such as Republic Ireland manager Eion Hand and Welsh players Ron Davies & Wyn Davies. In 1986, He gained some fame by scoring a spectacular diving header own goal in the Arc’s 3-1 BT Top Eight Cup Final victory over Bidvest Wits, the competition is South Africa’s oldest cup competition. The pre season that saw all 5 friendlies played at Croft Park with comprehensive victories over Wearside League Wallsend Town & Northern Alliance sides Wallsend Athletic & Belford Blyth lost 1-2 to Fourth Division Hartlepool and then 2-5 to a Sunderland XI. The Rothmans Northern League season started on 17th August but the league had been thrown into turmoil 3 days before the kick off when Stanley United who had finished bottom of the league in 1973/74) resigned leaving the league with only 19 clubs. (Blyth side: John Lang, Alan Cruddace, Gordon Smith, Eddie Alder, Ronnie Scott, Ronnie Phillipson, Micky Lister, Ian Nixon, Brian Slane, Mick Dagless, Micky Pink). August ended with 2 more victories and a 1-1 draw at local rivals Ashington (Mickey Pink scoring), the 2 victories were consecutive wins over South Bank a 8-1 hammering at Croft Park that saw the Spartans 6-0 at half time, the goals came from Alder, Cruddace, Dagless, Nixon and star striker Brian Slane opened his account for the season with 4. The away victory was a much tighter affair due to Mick Dagless missing a penalty in a 4-3 victory. September saw Blyth pull clear at the top of the table with 6 victories in the 7 games played scoring 21 goals and only conceding 3 goals with Mick Morgan between the sticks for the September games. Mick Pink & Ian Nixon both scored braces in the 4-0 win at Consett, Nixon Slane & Dagless scored in the narrow 3-2 victory at home to Bishop Auckland. 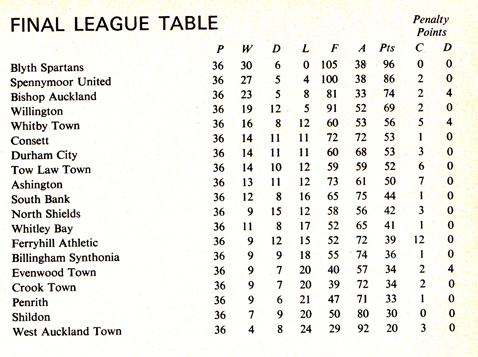 A week later Blyth travelled to West Auckland and hammered them 5-0 (Slane, Dagless, Lister & Pink 2) that was followed by a narrow 1-0 victory at Billingham Synthonia thanks to a Eddie Alder goal. 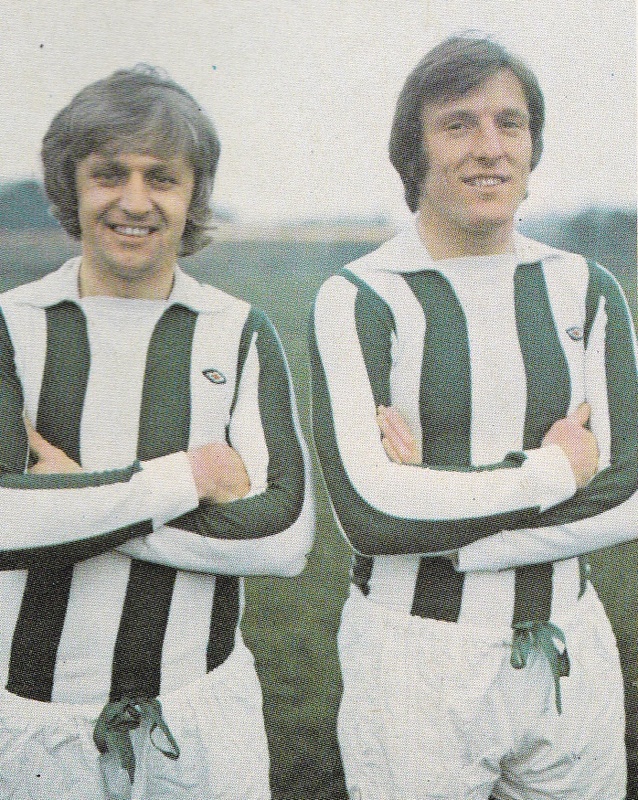 The local derby against Ashington on 21st showed Blyth qualities as Colliers were brushed aside in a 4-1 victory thanks to braces from Mickey Pink & Phil Baines. The 7 game winning run came to an end on Wednesday 25th September when North Shields held Blyth to a 2-2 at Croft Park with former Robins midfielder Mick Dagless & Brian Slane scoring. 3 days later Blyth travelled to North Yorkshire and beat Whitby Town 2-0 with Slane scoring his 10th goal in 11 games so far, Mickey Lister got the other. October saw Blyth play 6 games and all of them were home games, Alan O’Neill’s side sweeping to 5 straight league victories, beating Durham City 3-1 (Slane 2, own goal), Whitley Bay 2-1 (Slane, Pink), Consett 3-2 (Scott, Dagless, Alder), Billingham Syntonia 4-1 (Slane, Alder, Dagless 2) & Evenwood 3-0 (Lister, Slane, Pink) the month ended with a League Cup Preliminary Round tie with Bishop Auckland Mickey Lister got Blyth goal in a 1-1 draw that brought to an end a 14 game winning run. November was big month for the club on and off the field, O’Neill pulled off the major coup of signing the experienced Gerry Donoghue from Scarborough, only for the FA Cup 4th Qualifying Round draw bring the high-flying Northern Premier League side Croft Park on Saturday 2nd November. Gerry didn’t play against his former club as a crowd of 1,478 saw Brian Slane, Ian Nixon & Micky Pink score in a superb 3-1 victory to put the club into the First Round for the 2nd season running. (Side that day: John Lang, Alan Cruddace, Gordon Smith, Eddie Alder, Ronnie Phillipson, Dave Bukowski, Micky Lister, Ian Nixon, Brian Slane, Mick Dagless, Micky Pink). In the league the Spartans continued their relentless march thrashing West Auckland at home 6-1 with Mick Dagless scoring the clubs 1st hat trick of the season, Micky Pink got his 10th & 11th of the season and there was a debut goal for Gerry Donoghue. 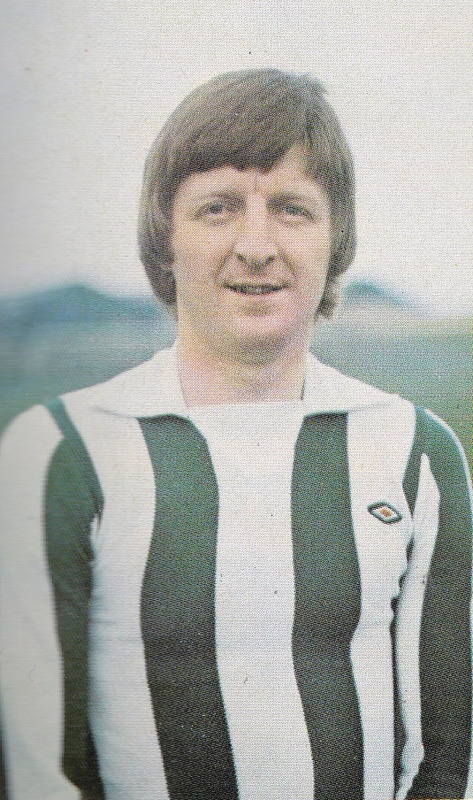 Blyth then beat Penrith 2-1 away (Pink, Dagless) before once again North Shields held the Spartans to a score draw, this time Gerry Donoghue scored his 2nd goal in 3 games & Ian Nixon bagged a brace in an entertaining 3-3 at Appleby Park. Saturday 23rd November saw a famous day in the history of Blyth Spartans AFC and Croft Park itself when FA Cup 1st Round opponents Preston North End came to Croft Park, a sell out 8,500 crowd crammed into the ground to see the Player Manager Bobby Charlton and fellow 1966 World Cup winner Nobby Stiles. Charlton (2nd left) lets fly with one of his trademark thunderbolt shots. Blyth stunned their illustrious opponents when Mick Dagless spectacularly fired the Spartans into a 3rd minute lead, however Mike Elwiss levelled for the recently relegated Third Division side as the tie ended 1-1. (Blyth side: John Lang, Alan Cruddace, Gordon Smith, Eddie Alder, Ronnie Scott, Dave Bukowski, Micky Lister, Gerry Donoghue, Brian Slane, Mick Dagless, Micky Pink. Sub:Ian Nixon). 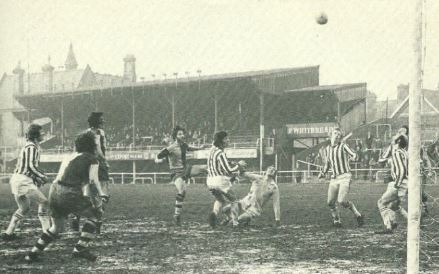 Blyth’s next 2 games were also cup ties, on 30th November a solitary Brian Slane strike won an FA Trophy 3rd Qualifying Round tie against Ashington at Portland Park, having played in all 23 games so far it was the Alan Cruddace missed the game through injury (an injury that was to eventually end his playing career!). On the 7th December Blyth finally managed to fit in the League Cup Preliminary Round replay at Bishop Auckland. The game once again ended all square as Mick Dagless missed a penalty leaving Blyth needing extra time to find a winner, with another brace from the prolific Brian Slane and a winner from Gerry Donoghue finally sealed a 3-2 victory. Bad weather meant it was another fortnight before Blyth played again giving the team a much-needed break, Blyth were back in action on 21st December, and game provided Blyth’s 20th unbeaten league game proved to be a defining one when Blyth travelled to Dean Street to play struggling Shildon and it turned out to be a far tougher game that expected Gerry Donoghue took over the penalty duties following Mick Dagless’s recent missed and not surprisingly scored with his 1st penalty for the club but Dago got on the score sheet himself with a brace while Ian Nixon scored his 8th of the season however Blyth’s 4 goals were matched by 4 from the Railwaymen and it was certainly a tale of a penalty scored and one crucially missed that made the headlines as Shildon dramatically missed a last-minute penalty to win the game!. Boxing Day saw Blyth playing Ashington for a 4th time when they meet in a Northumberland Senior Cup 1st Round game winning 2-1 thanks for goals from Gerry Donoghue (his 5th goal in 9 appearances) and Micky Pink, the saw defender Tony Smith make his debut following his recent signing from Scarborough. January’s 4 games included 3-2 league victories over Whitby Town & Penrith with the strike force of Mickey Pink scoring 1 in both games & Brian Slane getting a brace in both games, the Penrith game on 18th January saw Tommy Dixon make his club debut having joined from local rivals Ashington and keeper John Lang made his final appearance for the Spartans before signing for Newcastle United on trial. In-between the league games Blyth crashed out of the FA Trophy losing 1-2 at South Bank with Mickey Lister getting the Blyth goal, it was the Spartans 3rd cup defeat of the season. Next up was a double-header with Ferryhill Athletic, Gerry Donoghue earned a point in a 1-1 draw before a comfortable 3-0 victory at Croft Park the following Saturday with Brian Slane scoring his 2nd hat-trick of the season taking his tally to 25. It was a fortnight before Blyth were in action again on 15th February and the goals continued with a superb 4-0 victory at Whitley Bay with goals from Alder, Lister, Dagless & Donoghue. Mick Morgan is unable to stop Alan Shoulder putting Bishops infront. Blyth them won a crunch game at title rivals Bishop Auckland on 22nd March and showed their determination coming from behind after Alan Shoulder has giving Bishops a lead Mick Dagless scored an equaliser and Micky Pink scored the winner as Blyth came from behind to seal 3 impressive points making it 68 points from 26 league game and leaving Bishops 19 points behind Blyth at the top of the table. Bishops pile on the pressure for an equaliser, Phillipson, Scott & Dixon look on as Morgan’s save deflects the ball goal ward for Alder to head clear. While Blyth were winning at Kingsway, Spennymoor won 3-1 at Whitby leaving them 2 points behind the Spartans having played 2 games more. Coming on as a 2nd half sub at Bishops was 21-year-old Dave Bukowski’s final game for the club before his move. “We are on top and we intend to stay there. We are not worrying about the other clubs, let them worry about us!” stated Blyth secretary George Watson. “The task of catching Blyth will be much harder this season. They will not be able to relax until they have the title in their grasp. Despite the fact we have not played well recently we have continued to pick up point. We showed at Whitby that when we know we have to do well the team can turn it on. We still have to go to Blyth and this game could well be the decider”. While it was coming down to a 2 horse race it hadn’t been that way until recently with Blyth in a 4 way battle with teams from County Durham Spennymoor, Bishop & Willington, however Willington’s challenging had fallen off the pace having lost only 1 game before February but recent draws had proved costly as the 3 points for a win & 1 for a draw had an effect on their challenge with 11 draws in there 25 games so far. Spennymoor United came to Croft Park on Saturday 1st March for a game the reigning Champions had to win if they were to attempt to halt Blyth storming to the title, Mick Dagless scored for the 3rd consecutive game but future Spartans striker Geoff Hart equalised for United and the game ended in a 1-1 stalemate the point was no good for United as they failed to close the gap. Fog then caused the abandonment of a Northumberland Senior Cup Semi Final against Wearside League Wallsend Town, Blyth were 1-0 up on the night through a Gerry Donoghue penalty before the ref called a halt to proceedings 5 minutes into the second half due to heavy fog. Blyth saw off struggling Crook Town 2-1 with goals from Lister & Dagless on Saturday 8th to move onto 72 points putting the club effectively 9 points away from the title. Former Spartan Peter Flaherty brought his Wallsend Town side back to Croft Park on the Wednesday night for the rearranged cup tie and 2 goals from Brian Slane in a 2-0 victory put Blyth into their second successive Senior Cup Final. Lister watches on as Slane crashed home the winning goal. A 2-0 home victory over Shildon on 22nd March, Lister & Pink scoring, then set up Alan O’Neil’s side for the crucial Easter period that was to ultimately decide the title, on Easter Saturday Blyth travelled to play 3rd place Willington. Brian Slane’s 30th goal of the campaign sealed a tight 1-0 win at Hall Lane that ended Willington’s challenge. The Easter Monday game was also away at Durham City and goals from Micky Pink & Mickey Lister sealed at 2-1 victory at Ferens Park. Spennymoor’s run of poor form since their point at Croft Park meant that Blyth would seal the title on Saturday 5th April if they beat Willington at Croft Park, a large crowd saw Blyth run out comfortable 4-1 winners with goal machine Slane opening the scoring and a Mick Dagless brace took his tally to 20 and Gerry Donoghue continued his 100% record from the spot to claim Blyth’s 2nd Northern League title. The manager & players then set themselves the aim in the remaining 4 league games to keep up the unbeaten run and go the entire League season unbeaten, 4 days after sealing the title Blyth travelled to Crook midweek and scored another 4 goals closing in on the magical 100 goal tally, winning 4-2 at Millfield with a Micky Pink hat-trick and another from Brian Slane. An away game at Evenwood was won 2-0 with the defenders getting in on the scoring act when Gordon Smith scored his only goal of the season and Ronnie Scott got his 2nd of the campaign and the clubs 100th league goal, it was rather ironic that a defender should score the landmark goal with the free scoring forwards in the side it was the 1st time in 6 games that either striker, Pink or Slane failed to score. Wednesday 16th April then brought Blyth their 2nd piece of silverware when Mickey Lister & Micky Pink scored in a 2-1 Northumberland Senior Cup Final victory over Wearside League Blue Star under the floodlights at St James Park to keep the cup, Blyth team that night: Mick Morgan, Tony Smith, Gordon Smith, Eddie Alder Gerry Donoghue, Ronnie Scott, Ronnie Phillipson, Mick Dagless, Micky Lister, Brian Slane, Micky Pink. Sub: Ian Nixon. This rare colour team photo was taken before the final home game and shows both trophies won that season. It only ever appeared on the cover of the 1st 1975/76 Rothmans magazine. Back Row (LtoR): Alan O’Neill, Billy Fenwick, Alan Cruddace, Ronnie Phillipson, Tommy Dixon, Mick Morgan, Ronnie Scott, Micky Pink, Ian Nixon, Tony Smith. Path Smith. Front Row (LtoR): Mickey Pink, Gerry Donoghue, Brian Slane, Eddie Alder, Mick Dagless, Gordon Smith. Blyth then ended what was to become a truly historic season with a double-header against Tow Law, wining 2-0 at the Ironworks Ground on 19th April with Eddie Alder & Micky Pink scoring and the curtain was brought down on the season with an easy 3-0 home victory on Wednesday 23rd April thanks to goal from Gerry Donoghue, Mick Dagless and the clubs 121st and final goal of the season coming from Ronnie Scott the victory give the Spartans a final points total of 96, ten points clear of runners-up Spennymoor. It was an impressive haul as Blyth put last season’s disappointment behind them with real style, not surprisingly it was the club’s highest points haul in their 11 seasons since joining the Northern League in 1964/65 and an impressive 37 more points than the achieved to win the title for the 1st time in 1972/74 and that season 38 games were played in a 20 team league. It was a remarkable achievement and Blyth became the 1st club since Shildon in 1936/37 to win the Northern League without losing a single league game, it was the 4th time in the League’s long history (founded in 1890 the Northern League is the oldest football league in the world) it had been achieved with Middleborough Ironopolis in 1892/93 being the first to do it then in 1898/99 Bishop Auckland achieved it, however they were with significantly smaller leagues the previous times it had happened. There was only 6 teams in the league in 1892/93 and Ironopolis only played 10 games to win the title (winning 9 & drawing 1) and in 1898/99 the league only had 9 teams when Bishops achieved it by playing only 16 games (winning only 9 & drawing 7) in 1936/37 there was only 14 teams in the league when Shildon played 26 games to win the title (winning 20 & drawing 6) so Blyth’s unbeaten title season is a far greater achievement. And still to this day some 38 years later it hasn’t been done since, the closest being in 2004/2005 when Dunston Federation Brewery won the title losing only 1 game in a 21 team league. the last unbeaten champions Shildon !. Rothmans had introduced a series of sponsorship incentives when they started their revolutionary sponsorship deal back in August 1974, they included the Sportsmanship Pool where teams lost 4 points if a player was sent off, and 1 point if a player is cautioned if a team lost 8 points or more in the course of a season it would not qualify for a share of the £2,000 ‘Sportsmanship Pool’. As well as the prize money for winning the league of £1,000, Blyth also claimed £440 from the ‘Match by Match Incentive’ scheme were a team winning a game by 3 clear goals earned £40 and Blyth did it 11 times brining the total sponsorship winnings to £1,615.84p, Blyth finished the league top scorers with 105 goals however runners-up Spennymoor, who scored 100 goals, earned the most with their 13 victories brining in £550. Blyth played 46 games during the season, 36 league games 10 cup games, and only lost 3 times in FA Cup FA Trophy and Northern League Cup 8 games were drawn, 121 goals were scored and 53 conceded, 16 goals were scored in the cup ties and 15 were conceded. John Lang 18, Tommy Dixon 15, Phil Bains 9, Mick Third 2, Alan Wallis 1. Micky Pink & Gordon Smith played in every single game and only 15 substitutes were made in those 46 games. 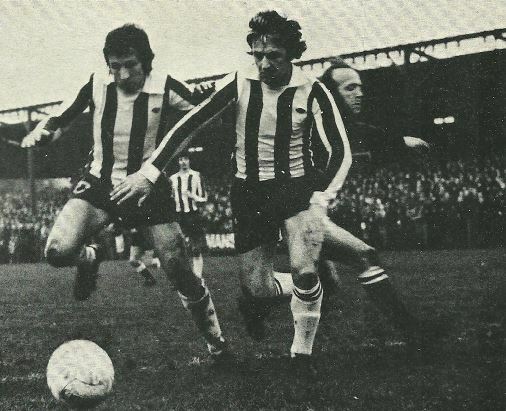 2 hugely popular players, Micky who lived only 150 yards from Croft Park had joined his hometown club in summer of 1973 after returning home from University in Liverpool, while on Merseyside Micky had played for Marine AFC in the Cheshire League and in 1970/71 had been top scorer with 14 goals, the strong bustling striker had formed a formidable partnership with Brian Slane in the past 2 seasons and had scored 16 goals in his first season. Gordon Smith had been with the club since 1967 and had become huge crowd favourite, having arrived at Croft Park as flying left winger in 1971 manager Allan Jones converted Gordon to a left back he been tearing down the wing at every opportunity ever since. His cavaliering style of play had made him hugely popular with the fans who had nicknamed him ‘beep beep’ after the Roadrunner cartoon. Brian Slane 30 (L 25 C 5), Micky Pink 23 (L20 C3), Mick Dagless 22 (L21 C 1), Mickey Lister 10 (L7 C3), Ina Nixon 10 (L9 C1), Gerry Donoghue 9 (L7 C2), Eddie Alder 6 (L6), Ronnie Scott (L3 C1), Phil Baines 2 (L2), Allan Cruddace 2 (L2), Gordon Smith 1 (L1) and 2 own goals. Club legend Brian Slane top scored with 30 goals (25 league 5 cup) however he only finished 3rd top scorer in the League beaten by Brian Pringle (Ashington) & Alan Shoulder (Bishop Auckland) who shared the league top scorer accolade with 27 goals. It was a great season for Slane on Sunday 4th May it ended with a TV appearance, as a school teacher in Consett he was selected to represent ‘Consett, Derwentside’ in the popular TV programme It’s a Knockout. Filmed at Beamish Park on Sunday 4th May 1975 the Heat 4 which was aired at 8pm on Friday 13th June featured team from Berwick-upon-Tweed, Darlington & Consett, Derwentside. This was one game Brian did lose that season along with teammates Barry Chucsin, Michael Fleck, Barry Fowler, Rachel Harrison, Christine Ross, Colin White, William Witton & Malcolm Young they finished 3rd with 18 points as Darlington won to qualify for the next stage in Switzerland in July. 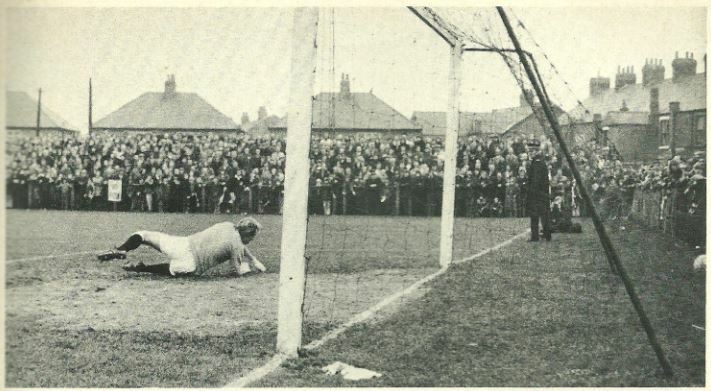 PNE keeper Ray Trunks is beaten by Mick’s thunderbolt. Midfielder Mick Dagless, who scored 20 goals to become the highest scoring midfielder in the league that season and probably the goal of the season with that 3rd minute 30 yard screamer against Preston North End, was rewarded with selection to the Middlesex Wanderers squad for the summer tour of Malaysia. The mercurial talents of Micky Lister won the club’s Player of the Year award, however it was all good news for the player who had won the FA Amateur Cup with North Shields in 1969 when having picked up a knee injury he spent the summer trying to overcome it but in July the club was rocked with the news that Mickey had to call an ended to his playing career !. It was probably the only downside to an incredible season and a one manager the manager Alan O’Neill was rightly proud of, he went onto prove it wasn’t beginners luck either when he rebuilt the side over the summer to retain the title again in 1975/76 although it was a lot tighter with Blyth making up the ground to pip Willington to the title by 1 point !. The unbeaten run continued into 1975/76 season winning the first 3 games before drawing 0-0 at home to Spennymoor then winning next 3 games but the 40 game unbeaten run finally ended on 8th September 1975 , masterminded by former manager Jackie Marks his North Shields side won 3-2 at Appleby Park thanks 2 goals from Billy Yates & 1 from Ian Hopkinson in reply to Micky Pink & Gerry Donoghue strikes for the Spartans. It could be argued it was a 42 game unbeaten run with the final league 2 games of 1973/74 added because the Title Play Off game defeat to Spennymoor wasn’t an actual league fixture !. *Either way it was and still is the clubs longest unbeaten run in any of the 9 different leagues Blyth Spartans AFC have played in. 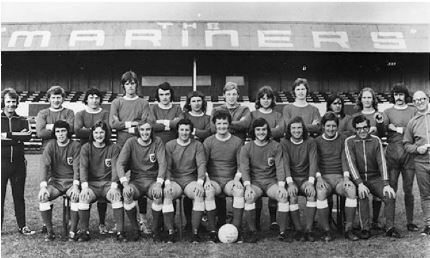 The 1970’s was a certainly a golden era for the club, 3 Northern League titles in 4 season’s 2 Runners Up spots and A League Cup win in 1971/72 and Runners Up in 1973/74 add into that endeavours nationally reaching the Semi Finals of the FA Amateur Cup in 1971/72 and the FA Cup runs in 1971/72 beating Crewe Alexandra away then Stcokport County at home before losing a 3rd Round Replay to Reading, in 1973/74 taking Grimsby to a 2nd Round Replay and 74/75’s games with the star-studded Preston North End. Obviously the famous 1977/78 season attracts all the attentions when the 1970’s are mentioned in Blyth’s long & proud history but that great achievement was built on solid foundations in the early 1970’s and should never overshadow a great era in the clubs history that included some great times, great servants and some superb players. Kevin Tilmouth, who as ever provided information & once again provided items from his treasure trove of Blyth Spartans memorabilia. Chris Sanderson, who provided images from his collection of Rothmans Non League magazines. Chris is now living in Paisley and reports on Scottish football but was born in Ashington and grew upon on Northern League football. Ken Teasdale, a lifelong Blyth fan who was a 21-year-old during that famous 74/75 season. Ken provided memories & vital info of that great era, he is now the clubs PA announcer. Ashington AFC website for allowing use of the Tommy Dixon photo taken from the superb collection of old photo’s taken by then club photographer Mel Morpeth. This entry was posted in Classic Team Photo's and tagged Bishop Auckland, Bobby Charlton, Brian Slane, Eddie Alder, FA Cup, Forest Green Rovers, Gateshead United, Hellenic League, Invincables, Isthmian League, Mick Morgan, Middlesbrough Ironoplis, Middlesex Wanderers, Nobby Stiles, Northern League, Portland Park, Preston North End, Ronnie Scott, Rothams Non League magazine, Rothmans, Rothmans Knockout Competition, South Shields, Spennymoor, Tommy Dixon, Umbro, Unbeaten, Western League, Willington. Bookmark the permalink. 10 Responses to Classic Team Photo’s – April 1975…The 1974/75 Invincibles !. Steve was one of the toughest and quickest defenders I had ever seen and played with. I remember travelling to London to play against Fulham, staying over one night at a top hotel we were eating our evening meal before going off to bed when Steve said that piano player isn’t very good,he said I could do better,we all laughed. Steve walked over sat down and started playing like a pro,when he finished he got up walked back towards us with a big red face because he always got embarrassed sat down and started eating again,we were shocked I was so impressed he was brilliant. I have bumped into Steve in many different places in Newcastle and we would chat for a while,im now coaching in Canada and have just heard the news,im shocked. I have lost a friend who always had a smile on his face. To Steve’s family I am so sorry. No sure why you would want to buy photographs of Mick Dagless but there won’t be anyone or anywhere selling them.